Optional Theme for Competition #2? Forum » Community Projects / Competition #2 » Optional Theme for Competition #2? The last time we went with the theme of Space Invaders which people could, or could not, use. What theme do we want to do this time? It was fun previously to see everyone's take on the same game, but do we want to mix things up and give a wider theme this time? Maybe we want to give two themes, one that's more open-ended, and the other that's a classic arcade game, like for the last competition. Personally, I definitely think we should have a classic arcade game theme - the main question for me is whether or not we do an open-ended theme as well. For the arcade game theme, maybe we should go with something like Thrust, but I'm open to other ideas. It's got a lot of physics and stuff that might be too challenging if this is supposed to be the easier theme, but it could be really fun to do, and the idea is relatively simple. Most of the time spent would be on actual coding, which is the fun part! Re: Optional Theme for Competition #2? Based on that, I think it is probably best to define the theme more loosely than last time. One thing that came up was to start by picking a game. (And Thrust would be a good choice for this.) The theme would be very loosely based on that game. But then we'd kind of pick apart the game for the "tropes" that it uses, and list some of them out as ingredients or components that you can pick and choose from to follow the theme more loosely. Of course, if you create a clone of the original game we picked, you'd be completely following all parts of the theme, but it would naturally give some more flexibility for people who want to try something a little different. This isn't intended to be a comprehensive list (it would definitely be subject to refinement) and I also have played too heavily on that TV Tropes site with the links and names. It was just easier to use that for the time being than come up with my own. I definitely do not feel like we need to stick with tropes from tvtropes.org. This kind of approach wouldn't necessarily give you an easier and a harder goal, but it would definitely give you a more focused (create a clone of the original game) and a less focused goal (pick any number of the tropes to use in your game). To be fair, though, it's easier to clone a game than to come up with your own that reuses elements of other games for inspiration. So perhaps it is also an easier/harder goal. How would that sound to people? I was just sitting here thinking about the theme thing, and even if we go the "trope" route, having a game like Thrust as the theme is still really useful. It gives the competition/challenge an identity. People can refer back to it by an actual name that people recognize and are familiar with. "Oh, I made that game for the Thrust competition last year," etc. Whatever the theme is.. Ill try to pick my own goal along those lines.. Ill be able to spend alot more time on this competition than last one.. so ill have a much bigger goal than last time. Do we want to add any other options for theme? I like the Thrust theme, but I'm OK with us listing other ideas as well, and having a vote of some sort on the final theme. We need to pick something before too long. We're now down to only a little over two weeks! Honestly, I'm probably going to use a trope for whatever we end up picking, so I'm okay with Thrust, Digger, or any other suggestions. I notice that PiscesMike hasn't commented, maybe we can get his opinion? 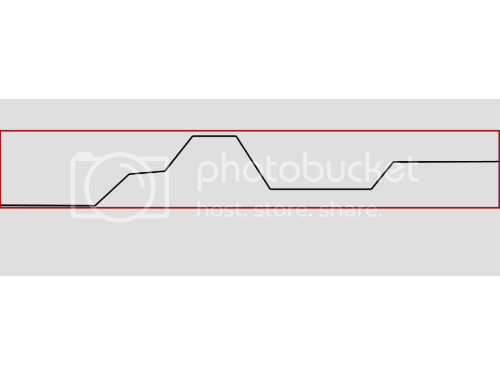 The red outlines what the texture boundaries would look like, but in reality, you'd want the player to move along a path that follows the black line, representing the 'floor' or 'ground'. Kind of off topic, but I've been curious about an efficient way to do this since pixel collision detection has gone the way to the dodo. For the Thrust clone game, that might actually come in handy since you would be flying over mountains and what not (possibly). Anywho's I guess what I mean to say, is I'm still pretty much open to any suggestions!